Why Buy Kichler Light Fixtures & Ceiling Fans? Kichler is a leading brand in both the lighting and ceiling fan industry. Kichler has a true dedication to their customers that ensures a successful and pleasant shopping experience. Kichler is often in the news surrounding impressive fixtures, new releases, and designs which speak to forward-thinking. Together, Kichler and many of their products have received over 55 various awards since 2008. These awards include the 2016 Quality Award by Builder Online, the Best Green Product Award from KBIS in 2013, and countless other recognitions for innovation, design, and appeal. Kichler is certainly a wonderful brand to shop when looking for a high-quality ceiling fan or lighting fixture. Kichler is always designing and releasing new products to meet their customers’ needs and style desires. Here are just a few of their newer releases that have grown in popularity with our Del Mar shoppers. Featuring a Weathered Powder Coat finish, the Kichler Arkwet is a three-blade ceiling fan which brings a contemporary style and a simple yet memorable aesthetic. This unique fan is wet rated for outdoor locations. The Arkwet can be both standard and angled mounted depending on your specific needs. On the Arkwet’s product page, you will also find six different light kits which are available as accessories to add to your Arkwet if lighting is something you would like to add. This five-light chandelier from the Monroe lighting collection is a unique twist on traditional Americana. The Kichler Monroe chandelier features a distinctive metal body. The Monroe is available in a Brushed Nickel or Olde Bronze finish. Both finishes beautifully highlight the etched glass lighting shades. The Monroe additionally has the option for you to choose between LED or incandescent lighting. We highly suggest choosing LED when given the opportunity. We also suggest checking out our Tuscan Style Lighting Guide, as this chandelier would fit wonderfully into the style. The Kichler Northland outdoor pendant from the Northland collection combines a white inner finish with a Matte Black exterior. This combination creates a beautiful display of vintage style and industrial design. The Northland would make a lovely addition to a nautical home. While it doesn’t feature Brushed Nickel, it’s downlight design and modern essence could float your coastal abode right along. Our Nautical Lighting Style Guide has a wonderful array of nautical fixtures if you are looking for something slightly different that still brings the maritime feel. You could also feature this beautiful pendant within other styles as well. You are always the painter of your own picture and the designer to your own dream home! Wow! Does this look like a ceiling fan to you? Personally, this ceiling fan reminds me of a boat propeller or a spinning star. This is appropriate since it is the star of my product spotlight! The Kichler Terna is certainly unique, but this isn’t the only reason it is a product to be acknowledged. The Terna has a low CFM rating which makes it a perfect fixture for areas which only need just a small breeze added. For example, the Terna may be a great choice for your office to avoid papers flying around, for your kitchen to create a stable cooking environment, or even for a children’s bedroom to save space but keep things cool. This fan is available in a Brushed Nickel, Oil Brushed Bronze, or White finish. It comes with a three-speed remote, light dimming capabilities, and a reverse. Making sure your ceiling fan has a reverse is especially important; particularly so if you are located in an area where the summer temperatures are far different from your winters. The reverse on your motor allows you to change the direction of your ceiling fan to either cool the house down or simply circulate the warm air. To learn which direction your ceiling fan should be spinning, we recommend you take a look at our informational guide: What is the Proper Ceiling Fan Direction. Once you see know whether or not you should be switching your fan’s direction, our how-to guide will teach you How to Reverse your Ceiling Fan Step by Step! Congratulations Kichler Terna! You have won the Product Spotlight Award! Why Buy Kichler from Del Mar Fans and Lighting? Like the sun attracts the planets, the Kichler Aleeka chandelier uses celestial inspiration to create its own gravitational force. Can’t you feel yourself being drawn to its beautiful design? Concentric rings orbit around a slim and sleek cylindrical center column. Oval globes seem to float almost weightlessly on top. The Classic Pewter finish delivers the final soft and contemporary touch. The Aleeka is available in a three-light or five-light option. It could most certainly be an exquisite touch for a contemporary or modern home. Kichler has an exceptional selection of chandeliers if you are looking for a quality chandelier with a different style as well. The Kichler Harvest Ridge wall sconce from the lodge-inspired Harvest Ridge Collection is reminiscent of a barn light. Its caged bottom encases clear ribbed glass with an inside etch. This diffuses light for optimal visibility. The Harvest Ridge would not only make a lovely addition to our Rustic Farmhouse Style Lighting Guide, but it could also be placed in any country-inspired room. The Harvest Ridge is available in both an 11-inch and a 15-inch option. This wall light is ETL approved for wet locations which means that it can be placed in almost any outdoor location. At Del Mar, all of our outdoor lighting is either wet or damp rated to ensure your safety and the longevity of your product. If you ever need specific guidance on where you can place your wet-rated or damp-rated fixture, you can refer to our Outdoor Lighting Guide. Shop All Kichler Outdoor Lighting! This beautiful Kichler LED Flush Mount ceiling light is a part of Kichler’s LED Flush Mount collection. The LED Flush Mount features clean lines and a white acrylic diffuser. This sleek and clean ceiling light is available in an Old Bronze or Brushed Nickel finish and can be purchased in either the 11.75-inch option or the 17.75-inch option. The Kichler LED Flush Mount is CSA Damp approved, ADA compliant, Energy Star rated, and Title 24 approved. This light is also dimmable which makes it a wonderful option for any room such as the bathroom, kitchen, bedroom, or den. Shop All Kichler Ceiling Lighting! The Kichler Palisades Teardrop outdoor pendant showcases an Olde Bronze finish and Chestnut Wicker style teardrop shade that draws inspiration from Bohemian-Chic styles. The Palisades offers a casual and laid-back look with this design. This pendant is ETL approved for damp locations so you could place it in various outdoor locations, or in interior locations which receive more moisture such as the bathroom and the kitchen. Other beautiful Palisades pendants from this collection are the Palisades Globe, the Palisades Bell, and the Palisades Cone pendant. Shop All Kichler Pendant Lighting! The Kichler Design Pro LED in-ground landscape light features a versatile design and a Textured Black finish. The support sleeve on this fixture allows for flush-mounting or angled-lighting; this is possible through a semi-recessed application. The Design Pro LED is available in 4.5, 8.5, or 12.4 Watts. It can also be selected with a 10-degree, 35-degree, or 60-degree beam spread. This landscape light not only brings contemporary style, but will help to bring safety to outdoor paths, and will ensure an elevated curb appeal to your home. Shop All Kichler Landscape Lighting! Many times, individuals aren’t quite sure where to pull their bathroom lighting from. An indoor nautical collection? An outdoor rustic collection? 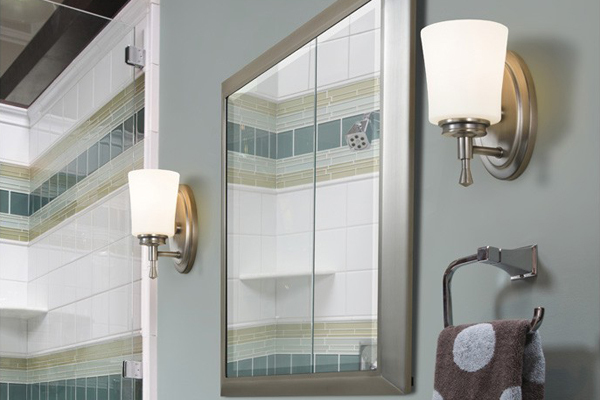 To make things easier for you, we have a whole spread of Kichler bathroom lighting for you to shop. 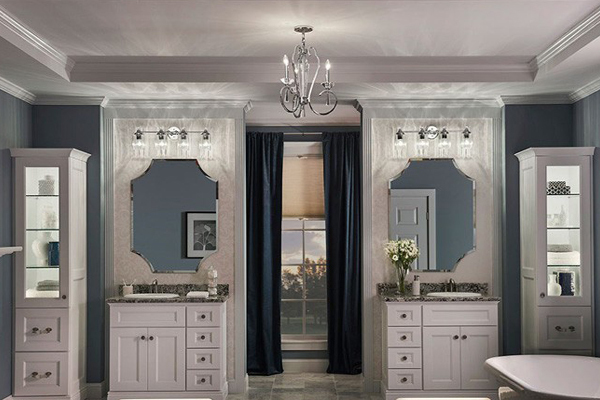 Kichler offers over 450 different wall sconces, ceiling lights, pendants, and more to make your bathroom just the way you want it. 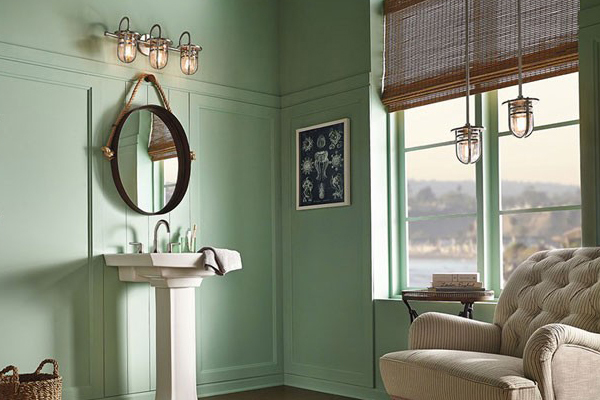 Below are just a few of Kichler’s top vanity lighting fixtures. Shop All Kichler Bathroom Lighting! This contemporary ceiling fan, the Kichler Sola, features integrated LED lighting and a flush mount installation. The globe inspired motor housing design brings delightful style to any space. It also allows for space saving as it mounts directly to the ceiling. The Sola is available in three different finishes and three different sizes. This Kichler ceiling fan also brings home a metal fixture cap for those who would like to use the ceiling fan without the lighting element. Lastly, one fun fact about the Sola and fans like it is that they are great huggers; in fact, The Best Huggers are Actually Fans! Shop All Kichler Hugger Ceiling Fans! With an Energy Star rating and a 6,201 CFM rating, the Kichler Monarch II Patio is an efficient fixture. Not only does it save on energy, but it will save you money on associated energy costs as well. The Monarch II Patio features reversible blades, a Weathered Powder Coat finish on top of steel, and a hot dip galvanized undercoat. Full-range light dimming is also available if you chose to add a light kit. This fixture is capable of being flush, angled, or standard mounted; this makes it a very versatile fan. Lastly, it is available in a Weathered Copper Powder Coat, Distressed Black, or a Weathered Zinc finish. The Kichler Monarch II Patio ceiling fan is a wonderful example of an outdoor ceiling fan which can fit in with various styles. For some other great options, make sure to check out our outdoor ceiling fans guide, Outdoor Whirled: The Best Outdoor Ceiling Fans. This guide will help you choose the best fan based on your location, style, and other factors as well. Shop All Kichler Outdoor Ceiling Fans! Inspired by industrial machinery, the 80-inch Kichler Szeplo is definitely a massive focal piece for any room or area! This large ceiling fan has an 11,399 CFM rating. For reference, you can visit our educational resource on The Best High CFM Fans for Residential Use. This explains what CFM means and gives some fabulous examples of high CFM fans. You really will be blown away when you notice that the Szlepo is a new release from Kichler which knocks the current top-of-the-crop fan out of first place! We will be shortly updating that list to give the Szeplo it’s rightful place at the top. The Szeplo allows you to pick between three finishes, three blade spans, and it comes with a six-speed DC wall control, light dimming, and reverse. Not only will your fan be very cooling, but it will be quiet, customizable, and well-lit. Shop All Kichler Ceiling Fans with Lights! Available in four different finishes and two different blade spans, the Kichler Lehr is CSA approved for wet locations and features seven angled blades. The Lehr is a beautiful example of a how ceiling fans without lights are just as beautiful and actually preferred by some. The Lehr can be standard or angle mounted and comes with a six-speed DC CoolTouch remote. People who have purchased the Lehr have said that they love the Lehr for its design, appeal, and performance. Perhaps you love the Lehr, but want lighting; a lighting kit can be added to this ceiling fan. Shop All Kichler Ceiling Fans without Lights! The Kichler Cameron certainly comes with lighting as it shows off with a large halogen downlight enclosed by etched cased opal glass. The Cameron also comes with a three-speed CoolTouch Remote with full-range lighting dimming. This helps to make things a little more laid back so that you can adjust the temperature of your room without ever getting up. If you would like a fan that can be reversed for the different seasons, the Cameron comes with a reverse switch on the motor. This is another ceiling fan which could easily be placed within several different styles, but especially the nautical style. Shop All Kichler Ceiling Fans with Remote! Keep in mind, that when shopping for Kichler lighting and ceiling fans, you are shopping with a brand which keeps your needs at the center of their designs. Kichler Lighting was founded in 1938 which means that they are a brand with about 80 years of experience developing new fixtures with quality materials. Once you have found your “Kichler keeper” to add to the cart, also remember that all orders over $40 ship for free! Shop All Kichler Ceiling Fans! What is your favorite Kichler fixture? Let us know in the comments below!